Crab Hole at the Florence north jetty SCUBA park is one of those dives that just about every SCUBA diver in Oregon has done at least once. Many people do their last one or two open water certification dives at the SCUBA park. Lots of people come over for an afternoon of diving from Eugene or a weekend of fun in Florence from Portland. The very easy diver-friendly entrance, the relatively protected inner area of the dive site, and the plentiful crabs out in Crab Hole make it an excellent place to have some fun. Even when the parking lot is full of divers, the site is big enough to accommodate everyone. The entrance at the Florence Dive Park and Crab Hole is custom-made for SCUBA divers. Sometimes a little debris gets washed up into the top of the old fish ladder but it usually isn’t too bad. This site has something for everyone. Most people will first mention Crab Hole, a feature of the jetty construction where there is a small semi-circular hole in the bottom that crabs congregate in by the mesh bag full. Many people will mention how easy the entrance and exit is. 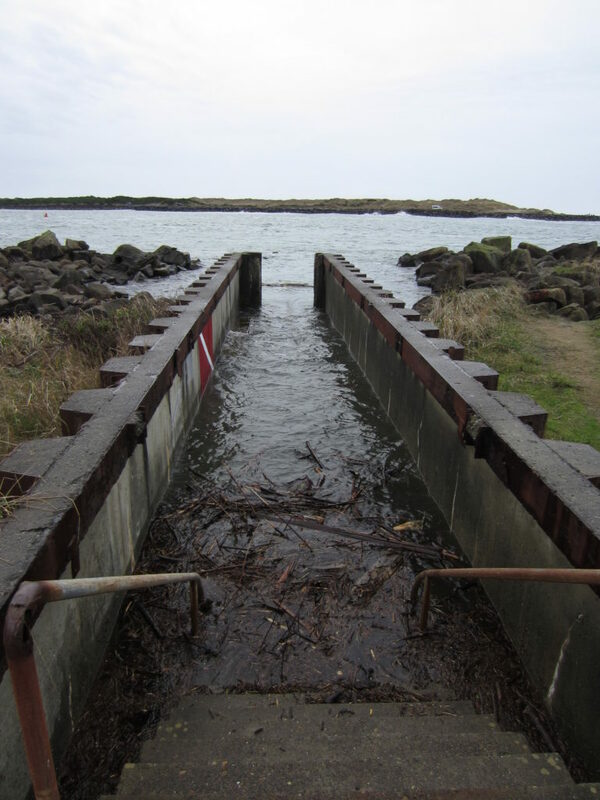 An old fish ladder was installed at the site specifically to make it easier for SCUBA divers to get into and out of the water. 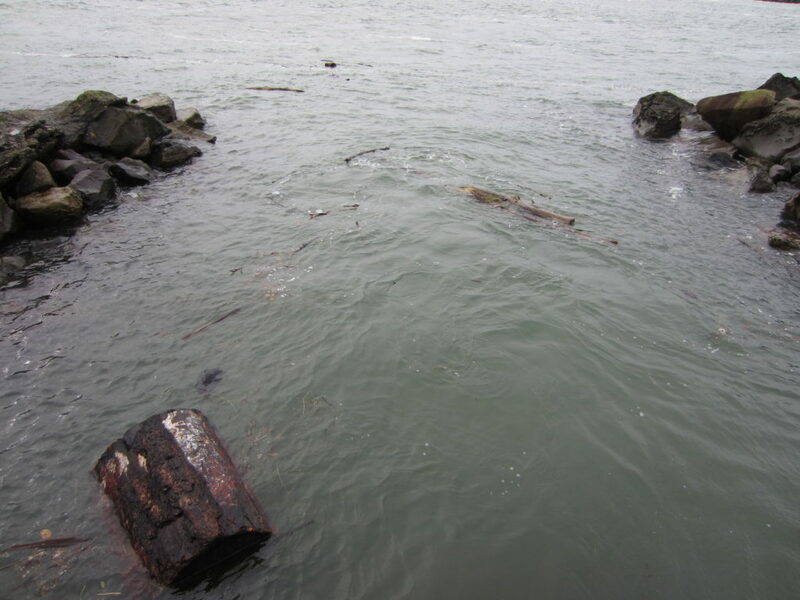 There isn’t an easier place to reach the water on any of the jetties in Oregon that we know of. We also love looking at all of the micro marine life at this site. There are a few protected spots that you can mostly get out of the current to go slow and check out nudibranchs, hermit crabs, barnacles, and other tiny things. It’s a little tricky finding this site without a GPS or navigation map on your phone. If you plug in the GPS coordinates listed above, your smart device will take you right to the site. Otherwise, take 35th Street west from US101 in Florence. Turn right onto Rhododendron Drive. Turn left onto North Jetty Road. Take the first left off of North Jetty Road into the large parking area. Parking has always been free and plentiful here. It is not uncommon to see several of the dive shops from the Willamette Valley have their trailers parked here while they run classes at the dive site. Imagery ©2017 Google, Map data ©2017 Google. An easy entrance, a bounty of crabs, and lots of parking — this dive site has it all! 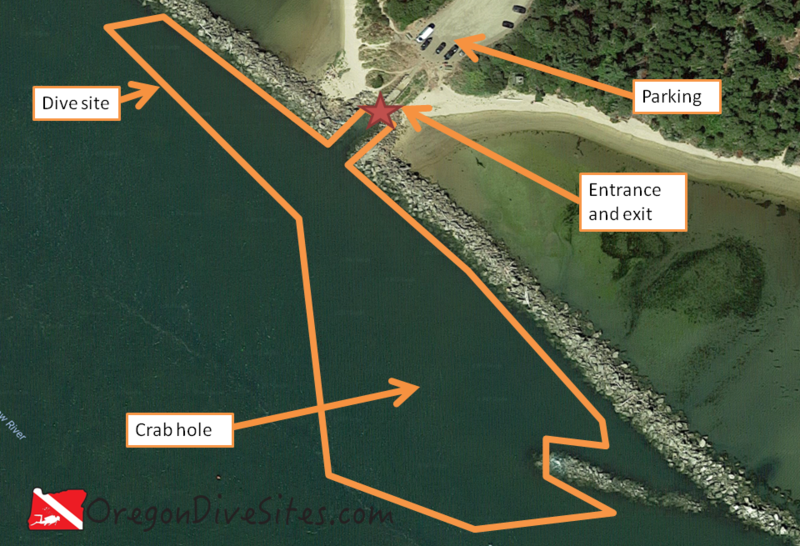 Crab Hole and the Florence SCUBA Park is a great place to go diving and get experience on the jetties of Oregon. The site runs from southeast to northwest. The entrance is roughly in the middle of the dive site. There is a big old pipe underwater that is a good marker for knowing where to surface to take your exit. Crab hole is roughly south from the entrance. If you get too far out into the shipping channel not only will you find nothing but sand but you will also potentially find strong current and shipping traffic. This is one of the easiest entrance/exit setups on the whole Oregon Coast. No other jetty has it this easy. You walk down some stairs into the old fish ladder where there are some benches you can sit on while you do final gear checks. Then step out of the end of the old fish ladder into the water, put your fins and mask on, and away you go! Just about anyone can do this dive site. Conditions here are usually good. Occasionally there is some surge but it is rare. Very occasionally a big storm can push wood and other debris up into the entrance area. We once did not dive here because some big logs were rolling around right where we wanted to dive. Nine times out of ten, this site is just fine to go diving. In really bad storms, logs and other debris can find their way into the entrance area at the Florence SCUBA Park and Crab Hole. On days like these, we usually go to a different site in Florence rather than deal with the hassle of logs. There is some current that you need to deal with especially on the western side of this dive site. This is a good place to practice dealing with current on a jetty. In crab hole itself, the current can swirl around in an unexpected way that can be disorienting to some people. Be sure to watch your compass so that you can stay oriented with the jetty. Usually we get about 15 feet of visibility when we go diving here. The bottom is sandy and can’t really be stirred up. On a rare day with a very big high tide, you might push 20 feet of visibility. It’s usually between 45 and 55F here. This site can be dived all year long. Crab Hole always has crab in it but check local crabbing regulations and make sure you have your permits in order. We have hit 55 feet in Crab Hole before. Most of the site is around 40 feet though. We have watched many open water divers finish their training dives here. This site is accessible to anyone who is certified to go SCUBA diving in open water. This is an easy dive suitable for beginners who are freshly certified and for people who don’t like the physically demanding entries at other jetties on the Oregon Coast. The only difficult part is the current can kick up and make your dive a little more strenuous. 20 feet if you get the best parking spot. None unless you want to for some reason. It’s a good idea to fly a dive flag here to let boaters in the area know that you’re underwater. A flashlight is a good idea when you’re in Crab Hole hunting for crabs and to peer in between the jetty boulders. A good mesh bag is what you need to put crabs in. We have our favorites for all of these gear items listed on our Gear We Use page. The site can get very busy with divers. Be sure you know what your buddy looks like underwater and stick close together. We have seen it happen more than once where a buddy pair will surface with different buddies than when they started the dive! There used to be a local dive shop in Florence although we haven’t been by in a couple years to confirm if it is still in operation. The last time we were in, you could get air fills and very limited SCUBA gear. The old waterfront in Florence has some great seafood restaurants that we like. There are several camping areas around Florence that the Oregon State Parks and Recreation Bureau runs. We haven’t tried any of the local hotels yet. Please let us know if there is a good hotel in town that is SCUBA friendly that you have tried!